So, you’ve visited a school, and seen its new “big idea” in action. The reception area of the school proclaims, “We are an X school!”, where “X” is the big idea: Flipped Learning, Bring Your Own Device, One-to-One, or anything else. It looks great – wonderful, in fact – but will it work in your school? Here are seven things you need to consider. Great idea -- but will it work in YOUR school? This is the effect named after the experiments in the 1920s in which researchers turned the lighting levels up in factory, with the result that productivity increased. Then they turned the levels right down -- and productivity just kept on rising. Some people explain this by saying that the workers knew they were being observed. Possibly, but an alternative suggestion is that workers were consulted, instead of just having it done to them. Whatever the actual reason or combination of reasons, it implies that when you see something great going on in a school, part of the explanation could be the Hawthorne Effect. That, in turn, means that perhaps you could get similar results with a different idea, or a less expensive one. In other words, the results you are seeing may not be due to the intrinsic qualities of the idea itself. Similarly, research has shown that if you think, or are told, that a particular thing is going to work or not work, you subconsciously affect the outcome. When you observe great things going on in a school with a new peer mentoring policy, for example, part of the effect may be due to everyone believing that it’s going to deliver great things, and perhaps the novelty factor too. Ecological validity is summed up in the question: is the school I’m visiting similar to the school I work in? That is, similar type of area, similar sorts of kids, and so on. It may work perfectly well in your school even if the answers to these questions are “no”, but it’s worth thinking about. To an extent, this could be regarded as an aspect of ecological validity. Has the school received a £1m Big Idea grant, to pay for staff training, materials and so on? Has the school been designated as a Big Idea Exemplar School? If it has, the organisation behind it won’t allow the initiative to fail: technical support will be instant, replacement parts will be couriered over straight away. Will your school get the same treatment? An informal version of this, and therefore another aspect of ecological validity, is indirect funding by the parents. If they are contributing to the running costs in some way (eg by having broadband at home), or paying for their kids to have extra tuition, you need to take this into account. Is it embedded or championed? If the initiative is being driven by one enthusiast, what happens when that person leaves? In a way, it would be better if what you saw was embedded practice because then you know it could work given enough time and support. This is an aspect of the preceding point. I visited a school once that had an absolutely brilliant technical support set-up. It was so good that most issues were dealt with before they became problems. The person running it was even poached by a large organisation, and it was so good that it still kept on working. But then a new deputy headteacher joined the school and decided that he didn’t like the system so he stopped supporting it. For example, the school dispensed with the services of the people who ran the help desk. Six months later, the technical support in the school was pretty dreadful. The technicians were still as good as ever, but the system of recording and dealing with issues had become defunk because of lack of support, including financial support, with results that should have been predictable. So you need to ask yourself: does my school have people in authority who understand the vision, who will support this initiative, and who are unlikely to leave before it really starts to prove its worth? Also, is there a way of building defences against the dismantling of a great idea just because a new senior leader doesn’t like it? One way would be to get the headteacher and everyone else to agree to what is known as a change management procedure, ie if someone has a bright idea, they can’t just implement it, they have to make a case for it, and it is then considered by someone or, better, a small group of people. This can be very frustrating for those of us who just like to get on with it, but it does guard against the phenomenon of huge lurches in policy and money wasted on pet projects. If the change suggestion is considered and responded to within a short time, it’s not too bad. It’s when organisations say “We consider change requests every 6 months” that employees think to themselves that they can’t be bothered. If you visit a school that is piloting something, or if you yourself are doing so, you need to ask yourself whether it can be easily scaled up. For example, you may decide, and be given the go-ahead, to run a tablet scheme with one class of kids. After a couple of months you report that it works like a dream, so the temptation is to buy in enough for every pupil. But there’s a bit of a difference between 30 kids all using wi-fi at the same time, and 300 doing so. Does your school have the requisite infrastructure? Are there enough teachers, technical support and knowledgeable pupils (digital champions) to make such a move workable? If the answers to these questions are disappointing, it doesn’t necessarily mean that you can’t adopt the big idea in your own school. It may mean that you have to spend more time preparing the groundwork, or simply going into it with your eyes more widely open and your feet more firmly on the ground. Good luck! 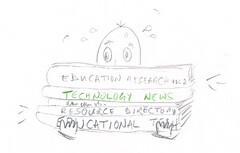 Your newsletter editor is hard at work doing research for Digital Education, the free newsletter for education professionals. Have you subscribed yet?